Many polymer materials are suitable for crosslinking. Generally, radiation crosslinking is suitable for all types of plastics which can be chemically cross-linked by the use of radical initiators (e. g. peroxides). However, unlike chemical crosslinking methods, radiation crosslinking takes place at low temperatures. 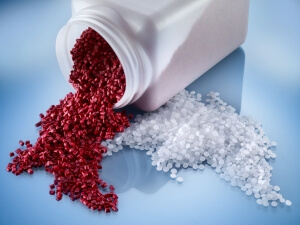 The ones most often processed in this way are those with the broadest range of applications: Polyethylene (PE) and its co-polymers, polyamide (PA), polyesters such as PBT and polyvinylchloride (PVC). For some materials with low reactivity, a special cross-linking promoter is required. These additives can be either added directly before the moulding process, mixed into the raw granulate as a masterbatch, or worked into the material directly by the manufacturer or compounder. When Polyamides are radiation cross-linked, they can withstand considerably higher temperatures of up to 350 °C and show a significantly improved abrasion resistance. The dimensional stability under thermal stress is also improved. Radiation cross-linked polyamide can often replace thermosetting plastics or high-performance plastics such as PPS, PPSU, PEI, LCP, etc. Important applications since many years are radiation cross-linked components for the electrical industry, e.g. switch components, the automotive industry, for instance components for the engine compartment and mechanical engineering. The preferred types at present are PA 6, PA 6.6, PA 11 and PA 12. In order for polyamides to crosslink, the material has to contain a special additive (crosslinking activator). Crosslinking of polyethylene (PE) extends the application range of this polymer to include uses with higher working temperatures and high mechanical and chemical requirements. All types of polyethylene (PE-HD, PE-LD, PE-UHMW etc.) and its copolymers (EPDM, EVA) can be radiation cross-linked. As a semi-crystalline material, PE is mainly crosslinked in its amorphous areas; the degree of crystallization and the density remain almost unchanged. Irradiation cross-linked PE-Xc is a highly desired material for pipes and tubes, for use e.g. in underfloor heating, gas and water supply. Many other applications benefit from the much improved mechanical properties of irradiated PE, e.g. in transport boxes, rotational molding components. Radiation cross-linked PBT becomes extremely heat resistant: short-term exposure to temperatures even up to 400 °C is possible. Important applications are e.g. the electrical industry, where thermosets are replaced by the thermoplastic material, providing benefits in much simpler processing. The crosslinking of thermoplastic elastomers (TPO, TPC and TPA) is increasingly gaining importance. Benefits are e.g. improved compression-sets and hot-sets, combining the easy processing of a TPE with properties extending into the range of elastomers. In principle, crosslinking of polypropylene is also possible, although this material can also predominantly tend to degradation. Selection of a suitable polymer grade or co-polymers in combination with a crosslinking promoter is the key to success. By its chemical nature, PU itself cannot be cross-linked by radiation. Special grades with a modified chemical structure are available, which can be easily cross-linked by radiation. Please consult with your raw materials supplier. In the recent years, many new materials and co-polymers have been made available to the market. It is impossible to list all available materials. As a general guide-line, radiation crosslinking is possible wherever chemical crosslinking with free radical initiators (such as e.g. peroxides) is possible. Please consult our experts if you have special demands.